The Montgomery Symphony Association is pleased to present its two artists-in-residence in a six concert series known as the Fellowship Series. These Fellows will be joined by a number of guest artists on these exciting chamber music programs. The concerts also allow opportunities for the Fellows to talk about the music including their personal interpretations. 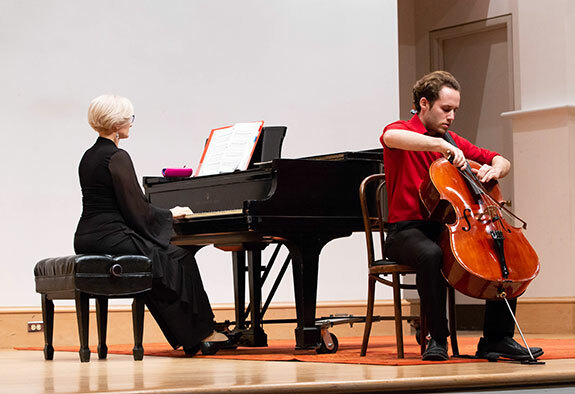 All Fellowship Series concerts are held in the Wilson Auditorium located in the Montgomery Museum of Fine Arts. Our thanks go to the Aaron and Marjorie Aronov Family Foundation for generously sponsoring the Fellowship Series. The Foundation carries forth the names and good works of one of Montgomery’s most visionary couples, philanthropists Aaron and Marjorie Aronov. Tickets for the six concert series are $85 for adults. Single tickets are available for $17 for adults. Students age six and over are admitted free.